Venturing off to Kingsway one weekend afternoon we wanted to try something new. Food court options can sometimes be limiting when trying to find gluten free friendly restaurants or menu options. We decided to look up Thai Express which is found in several food courts in Edmonton. Line explained when ordering you should ask something like "May I have a Pad Thai chicken with the vegetarian sauce?" Line also told us that they are in the process of finding new ingredients for more gluten free meals. As always restaurants are unable to guarantee no cross contamination so ask questions of your servers and ask them to use clean utensils to try and reduce the chance of cross contamination. We have tried the green and yellow curry dishes which have a nice kick and taste great. If you have any questions, click here to visit the Thai Express website and use their contact form. It took a while, but Thai Express was good at responding to my question. Gluten Free Travel to Toronto - Where to eat Gluten Free! If you are travelling to Toronto for vacation, business or to see family, you do not need to worry about gluten free restaurant options or gluten free shopping options because there are plenty. Eatings out in an unfamiliar city trying to find gluten free friendly options always seems difficult. After all, it can sometimes feel frustrating finding where to eat gluten free in our own city of Edmonton. South St. Burger is a concept from New York Fries! Fantastic burgers! This concept has not made it to Edmonton yet, but there is one in Calgary. They do not have gluten free buns, but they will put it on a bed of lettuce for you. Here is the catch, we all know New York Fries are gluten free! However, South St. Burger serves up onion rings :-( So there can be cross contamination in the fryers. We were told the onion rings are done in separate fryers but we didn't wish to take the chance because we were travelling and didn't want to be sick on the road. South St. Burger has over 25 toppings to choose from including some unique ones like goat cheese, guacamole, garlic mayonnaise, and mango chutney. Here is a must have while staying at a hotel or even walk in. Pizza Pizza is the sister company to Pizza73 here in Edmonton. The big difference is that Pizza Pizza has a gluten free crust! It is an additional $3.25 on a medium pizza, but atleats they have it! You also get a discount for pick-up, so it worked out to just over $11.00 for a two topping medium pizza. This is one of out must haves everytime we visit Toronto because Pizza Pizza has great pizza. Pizza73 could learn a thing or two from Pizza Pizza who has had this gluten free crust available since 2008. Having grown up in Toronto, I can tell you this is the best wings I have ever eaten - anywhere! We always go back to Duff's (Bayview location), each visit and we be sure to invite all our friends and family that are in Toronto. So the good news is that their wings are gluten free and are all fried in separate fryers. The french fries are however coated with flour and therefore not gluten free. So we would recommend ordering a side of salad. Duff's busiest night is Tuesday night as that is their cheap wing night. They also tend to get busy on Saturday evenings. The location is small, and when they are busy you could expect to wait up to 20 minutes. Located just a few store fronts over from Duff's, Hollywood Gelato's is one of the best Gelato places in Toronto. Gelato itself is gluten free, however you have to be cautious of the specialty flavours. All teh fruit flavours here taste great and will be gluten free. Be cautious when choosing the chocolate bar flavoured gelato's as you need to know your chocolate bars and which one is gluten free. All their gelato is made in house so if you have any questions about ingredients, they should be able to show you. We found this gluten free product at Ed's Gluten Free Store in Edmonton's south side at the same time that we got Dr. Praegers fish sticks. In comparison, these Pollock Bites were tasty but did not turn out as well as the Dr. Praegers fish sticks. Based on their size, I think the pollock bites would make a great late night snack or treat for the kids with some tartar sauce. Have you seen this product sold elsewhere? Email us at info@glutenfreeedmonton.com or leave a comment to let us know! Kyoto has been our favourite sushi restaurant since pre-Celiac, and it continues to be our favourite because Kyoto does it right when it comes to gluten free friendly restaurants! Kyoto has two locations: one downtown at Jasper and 109 St., in the plaza with the Save-on-Foods; the other is across High Level Bridge on 109 St., by the university. We stick to the university location because they have great service and their staff are understanding when accommodating gluten free substitutes. At Kyoto, you can order any sushi roll that does not have tempura (or eel). For rolls with tempura bits, you can substitute cucumber. Kyoto also supplies gluten free soy sauce, which is fantastic because it saves you from bringing your own. Our server also informed us that the Miso soup is gluten free. Kyoto's rolls taste great and are typically not overstuffed with rice. Always remember to let the staff know that you are Celiac and not allowed any tempura and require gluten free soy sauce. Where do you eat your gluten free sushi? For those that make the trip down the QE2 to Calgary, let us let you in on some gluten free travel tips! Road trip? Well your first stop is probably Red Deer for breakfast or lunch. We typically stop off at the Wendy's at Gasoline Alley, where you can order their Chili, Baja Salad, or baked potato. Their beef patty is gluten free as well, but you need to bring your own bun. Red Deer is a big town and will have most of the familiar chain restaurants. If you are willing to drive around a bit, I'm sure you'll find a Boston Pizza for some gluten free pizza. Zen 8 is a nice sushi restaurant located in downtown Calgary. 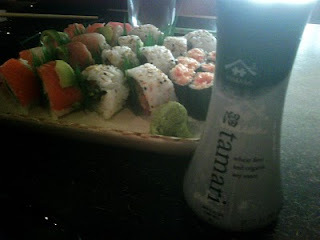 Although we were there for a special reception, they were able to handle special ordered sushi rolls with no tempura. Their volcano sauce was gluten free, however you need to bring your own soy sauce. Located in the Kensington district of Calgary, this vegetarian restaurant had gluten free written all over it. They have everything from gluten free grilled cheese sandwiches to gluten free pizzas. Although it's on the pricey side, it was a nice tasting meal, and great to scarf down a grilled cheese sandwich! Up for a little treat? Spoon me is a cute little yogurt shop similar to a Kiwi Kiss here in Edmonton. The yogurt is gluten free, and they spoon fresh fruits or other toppings. For under $5, you can have a baby-size cup with three toppings. The baby-size was big enough for two to share. As we have mentioned before at Gluten Free Edmonton, Boston Pizza carrys a gluten fee pizza crust made by Kinnikinnick. Boston Pizza locations can be found all over Calgary for an affordable pizza made great. Nellie's is an awesome breakfast restaurant with six locations across in Calgary. We tried out the Kensington location where they keep Kinnikinnick bread in stock from Safeway's gluten free section. Most of the menu was okay to eat, and they are able to substitute wheat bread with the gluten free bread they have on hand. Nellie's is a local favourite, and we saw why. The meal tasted great and wasn't terribly expensive. They also didn't charge extra for the gluten free bread. Although we didn't eat at the restaurant lounge in Hotel Arts, we did attend a wedding the hotel catered, and they accomodated many dietary restrictions. The raw bar was recommended to us by a friend with Celiac who lives in Edmonton. Hotel Arts is located in the heart of downtown Calgary. Have more to add about Calgary? Email us at asaraga@glutenfreeedmonton.com. 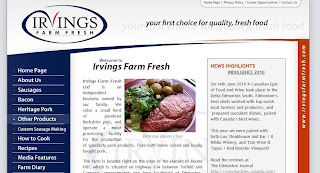 Irvings Farm Fresh is probably one of your best bets when looking for excellent gluten free (no filler) pork sausages. They have their own small herd of purebred Berkshire pigs, and operate a meat processing facility for the production of specialty pork products, from both home raised and locally bought pork. We first tried their sausages at the St. Alberta Farmers Market. We spoke with one of the owners Nicola who stood behind a gluten free sign and answered all our questions, including which sausage should we try and whats the best way to cook these bad boys! Nicola was really helpful, and I would imagine her husband and staff who operate their booths at the downtown and Strathcona market are just as helpful! 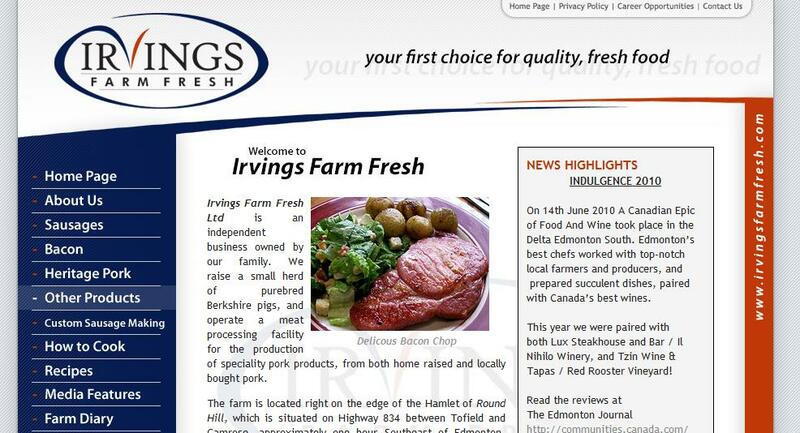 Where else can you find Irvings Farm Fresh gluten free sausages? 5032 129 Avenue, Edmonton, AB. #117 - 9303 34 Avenue, Edmonton, AB. 10b Perron Street, St. Albert, AB. 4345 - 50th Street, Edmonton, AB. What are the chances of finding a super tasty, light, flavorful, low-carb, gluten free, dairy free, nut free snack? You'd think slim to none, right! Well that's what I thought too. I thought it would be virtually impossible. Until one day when Abisaac's co-worker was sharing a variety of different flavors of CheeCha Potato Puffs at work. We first came across CheeCha potato puffs through an office mate of Abisaac's. She was sharing her new found treat with her co-workers. Low and behold...they had a super yummy line of Gluten free CheeCha puffs. Amanda: Are they actually gluten free? Abisaac: No not at all! They're really well flavored and they come in a variety of different flavors. Amanda: Well they must be only available in the USA then, right? Abisaac: Actually CheeCha's are from a family based business in Calgary, Alberta. Amanda: Holy! That almost sounds too good to be true. I have been hooked ever since. My personal favorite flavor is the Sea Salt and Spiced Black Pepper, but honestly they have a bunch of other flavors and they're each very tasty. As someone who has both Type 1 diabetes, needing to count my carbohydrates, and Celiac disease I have come to love the variety of flavors available from CheeCha's. Generally speaking gluten free foods are very high in carbohydrates therefore making eating sometimes feel like a diabetic nightmare. I have often told people that the low carb count of CheeCha's enables me to have a "salty" snack that is gluten free and even at times the amount of CheeCha's I can eat (for only 15 grams of carbs) is too much for me. I know! I couldn't believe it either. Our love of CheeCha potato puffs led us to become "CheeCha Champions". We do not work for the company, but we share our love of their products with others in hopes of spreading the word and speaking their praises. 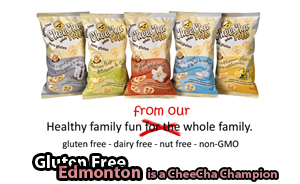 Where do you buy your gluten free CheeCha Puffs in Edmonton? This past weekend was a Community Resource Fair at Bonnie Doon Shopping Centre. In attendance were groups like the Edmonton Food Bank, Police Services and the Edmonton Chapter of the Canadian Celiac Association. Gluten Free Edmonton was able to volunteer some time in the afternoon to help raise awareness for Celiac Disease and to provide some of the great Celiac Association- Edmonton Chapter, resources to newly diagnosed people with Celiac disease. We were so pleased to see some of our fans who follow us on Facebook and/or Twitter, come out to see us and gather more information on Celiac Disease. It was truly a pleasure to see you guys! The Celiac Association has a wealth of information about Celiac Disease, the gluten free diet, and a schedule of seminars and classes they offer. Community events like this one are helpful to those newly diagnosed as well as those who have been living gluten free for years, to become more familiar with the association and the resources that are available to help. During this event, Gluten Free Edmonton was able to provide some of our gluten free living tips such as; where to eat gluten free in Edmonton, where to shop gluten free in Edmonton and some of the various gluten free products that we love, that can be found in Edmonton. We also had the opportunity to share and sample a personal favorite of ours, Gluten Free CheeCha Potato Puffs and even gave away coupons for some free bags. Click here to check out the Celiac Association - Edmonton Chapter website to find out about their upcoming events. Results of My One Year Wedding and Gluten Free Anniversary Dilemma! Over the past year of living gluten free I have occasionally felt the desire to eat some foods that in my pre-gluten free life I never would have even considered eating. Oddly enough I’ve found myself wishing I could just eat an Arby’s roast beef sandwich when in the food court at the mall with friends. I never ate that before. I’ve thought about eating a submarine sandwich from Subway or even a Harvey’s hamburger. 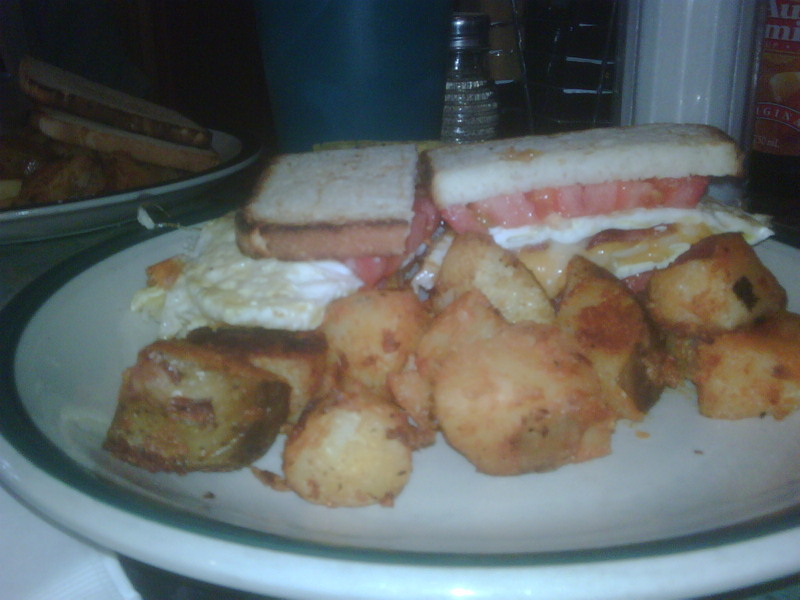 These foods are truly items that I would not have eaten even just one year ago, merely because I do not like them. Now, being gluten free, when asked “what do you want to eat” these are simply some of the foods that cross my mind. Of course I wouldn’t eat them now because of the gluten present in them, but also because I still do not like them. Weird huh? Last weekend, as you know was our one year wedding anniversary and while I have many things to say about how quickly this year has flown by and how happy I am to have such a wonderful guy in my life I will get right to the point. I know you’re curious to know what happened. Weeks ago I wrote the article "My One Year Wedding and Gluten Free Anniversary Dilemma!". I shared my plan to eat some of the top tier of our wedding cake on our one year anniversary and I was flooded with suggestions about what to do. I noticed that there was an undertone of “you’re nuts, don’t even think about eating it!” I was told that I might vomit, I might be sick in bed for days and I might consider having a different and gluten free cake made in honor of our one year anniversary instead. I might do all sorts of things and have various reactions to the gluten. 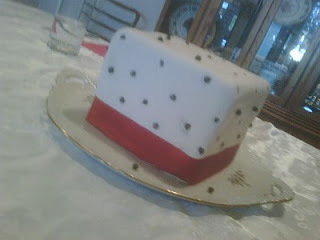 However, I was bound and determined to eat that wedding cake anyway. I chose to have a couple of my dearest friends over for Friday night dinner at my parents house where we enjoyed a fabulous gluten free meal (as always) followed by “the cake” mmm mmm good! It was just as wonderful as I remembered it to be. It was light and fluffy and full of flavour just as I remembered it from one year ago, and I loved every bite of it. Even though our anniversary was not until Monday September 6th we chose Friday night for the cake just in case of any major stomach troubles or difficulties with the gluten. I am pleased and still a bit shocked to say that nothing happened! Seriously, nothing. I did not feel sick, I did not vomit, I did not feel any stomach pain whatsoever. I was nervous and leery the whole weekend, almost waiting for something horrendous to happen to me, but I am overjoyed that nothing happened. One of my friends who was at dinner and has both a gluten allergy as well as a dairy allergy was plagued by the cake, but to my surprise I was fine. Now don’t get me wrong, this does not change my ideas about gluten or my plan to continue eating a fully gluten free diet for the rest of my life, no way! It actually makes me feel very thankful that I was able to partake in the tradition of eating the top tier of wedding cake on the one year anniversary. Initially I had kinda hoped that I would feel some form of reaction to the gluten, sort of to remind me that I need to follow the gluten free diet to a T. However, in thinking about how much better I feel when I eat fully gluten free and how much damage I know can be done to my small intestine just by eating gluten....I choose gluten free, hands down! Thanks for the support everyone and to my parents and my dearest friends for sharing our super yummy one year old wedding cake. The Edmonton Journal recently released a great article from the Calgary Herald about eating out with food allergies. There is a focus on gluten free eating, that has some great tips to consider when eating out. Eating out with food allergies: "Eating out with food allergies: A little planning and communication can make a meal in a restaurant safe"
Click here to read a recent update! 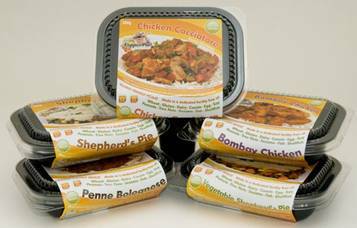 Copper Pot Creations is a gluten free brand devoted to creating meals that help people with food allergies. Their facility is dedicated to being 100% free of the most common food allergens in Canada, including gluten, wheat, eggs, dairy, casein, peanuts, tree nuts, soy, sesame, fish, and shellfish. Copper Pot Creations recent change to selling only gluten free meals was inspired when their head chef Chris was recently diagnosed with Celiac disease and Type 1 Diabetes. As a family business, Copper Pot Creations is now devoted to helping others in similar situations. Copper Pot Creations has been operating a business in Calgary for a few years and are now selling five products wholesale to retailers around Alberta, including Edmonton. 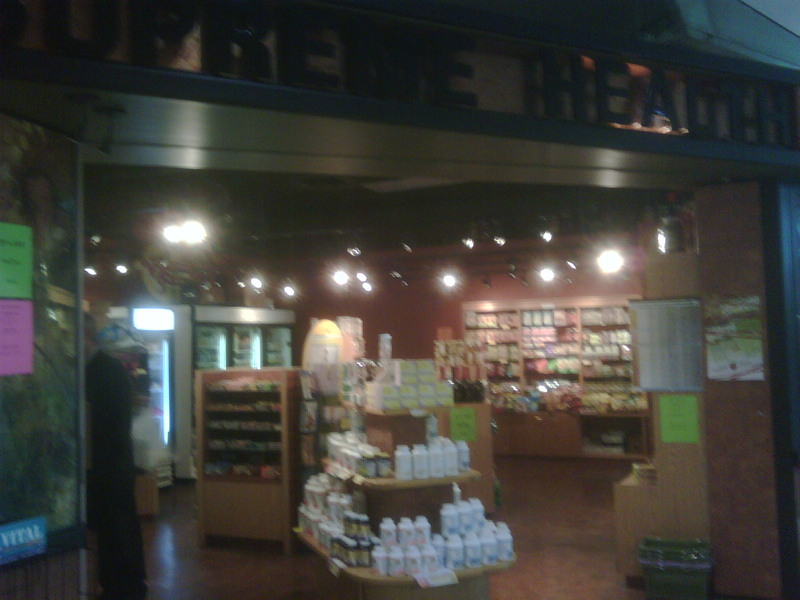 Their products can be found in stores located in Calgary, Red Deer, Edmonton, Medicine Hat, Canmore, and Okotoks. Have you tried any of these meals? Let us know what you think and we can post your product review! Read this article from the Edmonton Journal that talks a bit about Copper Pot Creations. When we lived in Toronto during our pre-Celiac era, Bulk Barn was one of our favourite places to shop. So many treats, so many interesting finds, and everything priced reasonably. Not to mention everything is in bulk, so you could purchase as little or as much as you want. A few months after our Celiac diagnosis, Bulk Barn opened its first Edmonton location at South Common. 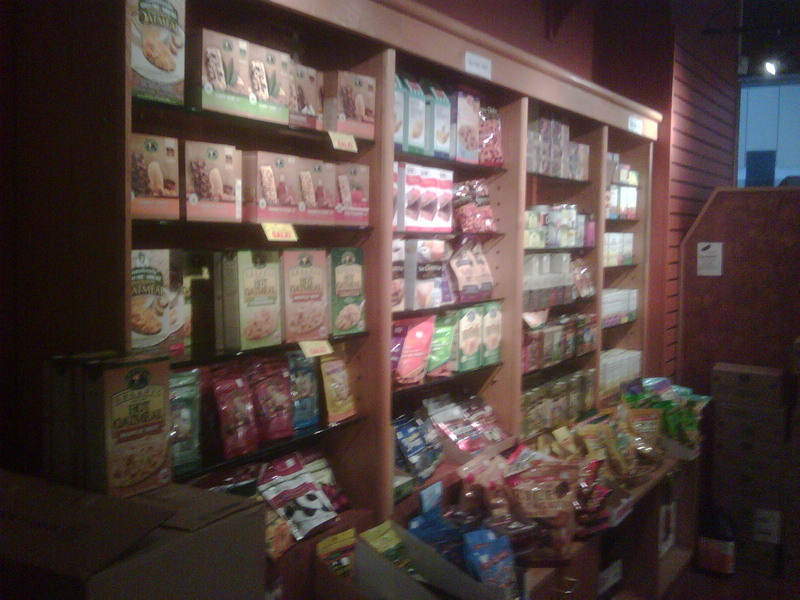 We initially went out of curiousity, to scope out some snacks and treats, not thinking we would be able to purchase much. To our surprise, Bulk Barn has expanded its product line to keep up with demands. They now have a line of organic and gluten free products. Click here for a full list of their health food products, including gluten free products. Walking into a Bulk Barn will make you wonder why you ever shopped in the bulk section at Save-on-Foods or Safeway. Each and every bulk container has a complete ingredients list that typically includes allergy information. 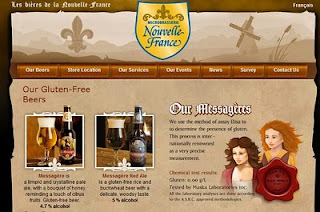 This allows you to ensure you are purchasing product that is gluten free. Many bulk bins also have special recipes or cooking instructions. This comes in handy especially when you purchase something like the gluten free brownie mix. Ingredients recipes are all tear away pieces of paper to take home with you! A bonus is the commitment of cleanliness Bulk Barn has at its stores. While shopping at the South Common location, staff were constantly wiping down containers, vacuuming the shelves, and changing scoops. 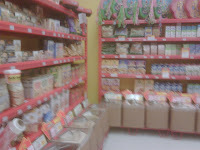 Bulk Barn is no longer a hidden gem to shop gluten free, it's a must shop! We found a great place for some gluten free shopping downtown in Edmonton. Even better is that this place is in the centre of the City Centre Mall! 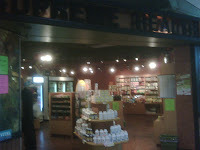 The Vitamin Farm is located on the east food level of City Centre at the bottom of the escalators. 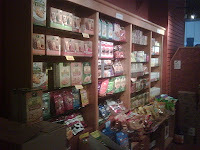 They have a selection of gluten free products including pastas, chips, crackers, cereals and snack bars. The best thing about The Vitamin Farm is their freezer full of Glutino frozen lunches – perfect for the days you forgot your lunch at home, or just don't feel like leftovers! I have tried La Messagére beer and found it a good enough pilsner. It's also available at Metro downtown - but I'm not sure I'd recommend eating here if you are looking for GF food. What other gluten free beers have you found in Edmonton?